Pastor Megan took us on a journey in this sermon. It is – to start – an invitation to prayer, then a snapshot, a wondering, a snippet, a slippery word, a preference, a story, a question, a complication, an affirmation, an encouragement, and – at last – a prayer. Come along for this exploration of generosity in the spirit of Jesus’ Sermon on the Mount and the prayer he taught in Matthew 6. Rose Marie Berger, “You and Madre Tierra,” Unsettling the Word: Biblical Experiments in Decolonization (176-7). “Welcome Here,” from the album “Songs of Contemplation for Travelers and Troublemakers,” written and composed by Rachael Weasley, (c)2018. Kate Bowler, “Death, the Prosperity Gospel and Me,” New York Times. Joy Williams, “WET,” ninety-nine stories of God (10). 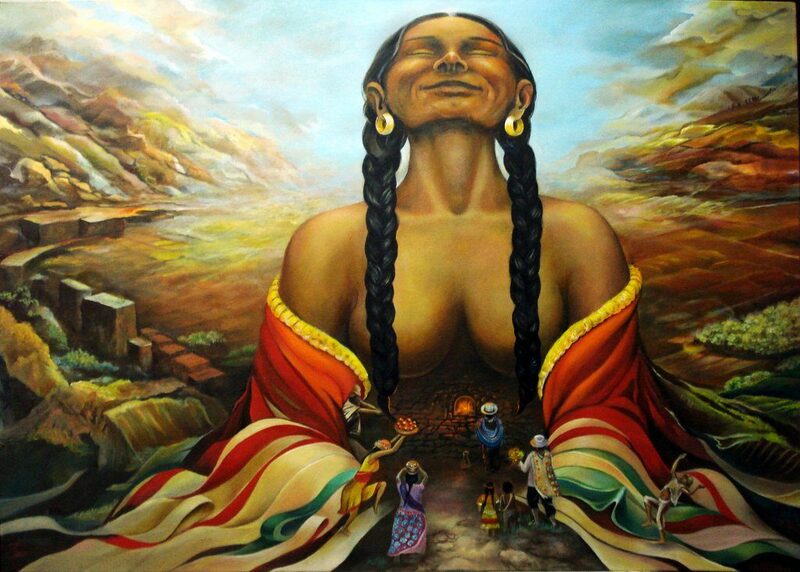 IMAGE: Ñuke Mapu (Mother Earth), by Alicia Fernández. “And when you talk to Creator, do not be like those whose prayers are like pine splinters, wheedling under the skin, for they only know conniving; they strap empty words to stone building and creeds, seeking to prop up their own spirits, which are as weak as badly mixed mortar poured in winter. It will neither set nor hold a foundation. Their temples will fall down, their beliefs will run out. “Our Creator in the sky, we kiss the earth before you. You order our steps, our fields, our days and nights. Today you gave us good maize for cornmeal and beautiful corn plants that make our hearts glad. When we sell ourselves or allow ourselves to be bought, we ask that you not demand too great a sacrifice from us to restore us to justice. Tomorrow we will make it right. Protect us from the one who sows borers in our crops and fear in our family. Protect us from the men with guns. For you are our Creator. All we have is you and Madre Tierra where we stand.” Amen.